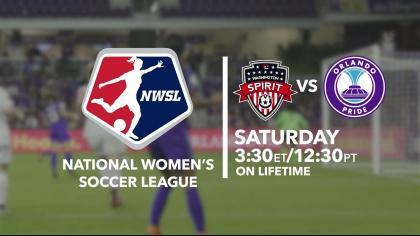 Sydney Leroux bagged a brace and Rachel Hill scored in the 83rd minute as the Orlando Pride beat Sky Blue FC 3-2 at Orlando City Stadium on Saturday night. The Pride have lost just once in their last nine games and moved to 5-3-4 (19 points) with the win. Sky Blue FC fell to 0-9-2 with the loss and are winless through their first 11 games, tying the 2013 Seattle Reign for the longest winless streak to start the season. The 2013 Reign also went 0-9-2 before earning their first win. Leroux wasted no time getting her first goal, scoring in just the second minute. 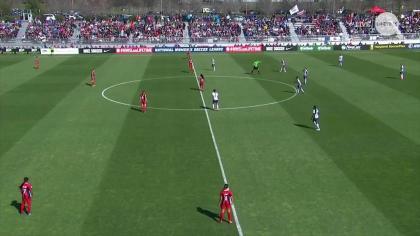 Chioma Ubogagu‘s pass skipped over the Sky Blue FC defense and to a wide-open Leroux in the box. Leroux took a few touches before striking it with her left foot to put Orlando up 1-0. Sky Blue FC equalized in the 16th minute when rookie Imani Dorsey intercepted a pass at midfield. Her pass sprung Savannah McCaskill and the two raced down the field on the break. McCaskill passed back to Dorsey, whose shot was saved by Pride goalkeeper Ashlyn Harris, but the rebound went to McCaskill who one-timed it home. Leroux put the Pride out in front again in the 31st minute, with a diving header to finish a cross from Christine Nairn. Nairn now leads the NWSL with four assists. But Sky Blue FC equalized again in the 37th minute courtesy of Madison Tiernan. Off a Sky Blue FC throw-in, Katie Johnson‘s shot was saved by Harris, but Tiernan pounced on the rebound to make it 2-2. Sky Blue stayed in the match, with both teams trading chances well into the second half. But Orlando subbed in Marta in the 73rd minute, and she made the difference in the match. Marta missed last week’s match with a calf strain, and was listed as questionable on this week’s injury report. In the 77th minute, she forced a big save from Sky Blue FC goalkeeper Kailen Sheridan. Then in the 83rd minute, Marta weaved through two Sky Blue defenders and found Morgan on the left wing. Morgan crossed into the box and Hill headed it home for the game-winner. The Pride remain in third place, but tied on 19 points with second-place Seattle Reign FC. The Pride will next visit the Washington Spirit on Saturday night (7 p.m. ET, ESPNEWS). Sky Blue FC gets another shot at their first win on Wednesday, June 27 on the road vs. Portland Thorns FC. Match ends, Orlando Pride 3, Sky Blue 2. Second Half ends, Orlando Pride 3, Sky Blue 2. Corner, Orlando Pride. Conceded by Dominique Richardson. Attempt blocked. Dani Weatherholt (Orlando Pride) right footed shot from outside the box is blocked. Assisted by Alanna Kennedy. Corner, Orlando Pride. Conceded by Kailen Sheridan. Attempt saved. Alex Morgan (Orlando Pride) left footed shot from the right side of the box is saved in the bottom left corner. Assisted by Marta with a through ball. Attempt missed. Carli Lloyd (Sky Blue) right footed shot from outside the box is close, but misses to the right. Assisted by Savannah McCaskill. Attempt missed. Imani Dorsey (Sky Blue) right footed shot from the centre of the box is close, but misses to the right. Assisted by Carli Lloyd. Poliana (Orlando Pride) wins a free kick in the defensive half. Attempt blocked. Imani Dorsey (Sky Blue) right footed shot from outside the box is blocked. Goal! Orlando Pride 3, Sky Blue 2. Rachel Hill (Orlando Pride) header from the centre of the box to the bottom right corner. Assisted by Alex Morgan with a cross. Substitution, Sky Blue. Thaisa replaces Katie Johnson. Imani Dorsey (Sky Blue) wins a free kick in the defensive half. Attempt missed. Alex Morgan (Orlando Pride) header from the centre of the box misses to the left. Assisted by Marta with a cross following a corner. Corner, Orlando Pride. Conceded by Amanda Frisbie. Attempt saved. Carli Lloyd (Sky Blue) left footed shot from outside the box is saved in the centre of the goal. Assisted by Mandy Freeman. Marta (Orlando Pride) hits the bar with a header from the centre of the box. Assisted by Poliana with a cross. Attempt blocked. Alex Morgan (Orlando Pride) header from the centre of the box is blocked. Assisted by Marta with a headed pass. Attempt saved. Marta (Orlando Pride) left footed shot from the centre of the box is saved in the centre of the goal. Assisted by Alex Morgan with a headed pass. Attempt missed. Sydney Leroux (Orlando Pride) right footed shot from outside the box is high and wide to the right. Assisted by Alanna Kennedy. Substitution, Orlando Pride. Marta replaces Christine Nairn. Attempt missed. Poliana (Orlando Pride) header from the right side of the six yard box is just a bit too high. Assisted by Christine Nairn with a cross following a corner. Attempt blocked. Rachel Hill (Orlando Pride) right footed shot from outside the box is blocked. Assisted by Dani Weatherholt. Carson Pickett (Orlando Pride) wins a free kick on the left wing. Attempt saved. 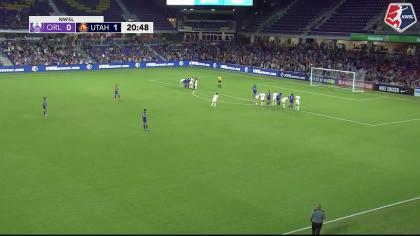 Carli Lloyd (Sky Blue) header from the centre of the box is saved in the centre of the goal. Assisted by Imani Dorsey with a cross. Attempt blocked. Amanda Frisbie (Sky Blue) left footed shot from outside the box is blocked. Corner, Sky Blue. Conceded by Christine Nairn. Janine Beckie (Sky Blue) wins a free kick on the right wing. Corner, Orlando Pride. Conceded by Janine Beckie. Attempt saved. Katie Johnson (Sky Blue) header from the centre of the box is saved in the bottom left corner. Christina Gibbons (Sky Blue) wins a free kick on the right wing. Substitution, Orlando Pride. Dani Weatherholt replaces Emily van Egmond. Attempt missed. Carson Pickett (Orlando Pride) left footed shot from outside the box is high and wide to the left following a corner. Attempt missed. Alanna Kennedy (Orlando Pride) header from the centre of the box misses to the right. Assisted by Christine Nairn with a cross following a corner. Corner, Orlando Pride. Conceded by Imani Dorsey. Attempt blocked. Savannah McCaskill (Sky Blue) right footed shot from the left side of the box is blocked. Assisted by Carli Lloyd. Attempt missed. Savannah McCaskill (Sky Blue) right footed shot from the centre of the box misses to the right. Assisted by Katie Johnson. Substitution, Sky Blue. Amanda Frisbie replaces Erica Skroski. Attempt missed. Sydney Leroux (Orlando Pride) right footed shot from the right side of the box is close, but misses to the left. Assisted by Christine Nairn. Attempt missed. Christine Nairn (Orlando Pride) left footed shot from more than 35 yards is just a bit too high. Offside, Orlando Pride. Alanna Kennedy tries a through ball, but Sydney Leroux is caught offside. Second Half begins Orlando Pride 2, Sky Blue 2. First Half ends, Orlando Pride 2, Sky Blue 2. Attempt missed. Carli Lloyd (Sky Blue) right footed shot from outside the box is high and wide to the right. Assisted by Katie Johnson. Foul by Poliana (Orlando Pride). Christina Gibbons (Sky Blue) is shown the yellow card. Offside, Orlando Pride. Chioma Ubogagu tries a through ball, but Emily van Egmond is caught offside. Goal! Orlando Pride 2, Sky Blue 2. Madison Tiernan (Sky Blue) right footed shot from the centre of the box to the bottom right corner. Attempt saved. Katie Johnson (Sky Blue) right footed shot from the left side of the box is saved in the bottom right corner. Attempt saved. Chioma Ubogagu (Orlando Pride) left footed shot from the left side of the box is saved in the centre of the goal. Assisted by Shelina Zadorsky. Attempt missed. Chioma Ubogagu (Orlando Pride) left footed shot from the centre of the box misses to the right. Assisted by Emily van Egmond. Goal! Orlando Pride 2, Sky Blue 1. Sydney Leroux (Orlando Pride) header from the centre of the box to the bottom left corner. Assisted by Christine Nairn with a cross. Delay in match Kailen Sheridan (Sky Blue) because of an injury. Christine Nairn (Orlando Pride) wins a free kick in the attacking half. Attempt blocked. Chioma Ubogagu (Orlando Pride) right footed shot from the centre of the box is blocked. Assisted by Carson Pickett. Offside, Orlando Pride. Emily van Egmond tries a through ball, but Alex Morgan is caught offside. Attempt missed. Alex Morgan (Orlando Pride) header from the right side of the box misses to the right. Assisted by Christine Nairn with a cross following a corner. Goal! Orlando Pride 1, Sky Blue 1. Savannah McCaskill (Sky Blue) right footed shot from the centre of the box to the centre of the goal. Attempt saved. Imani Dorsey (Sky Blue) left footed shot from the centre of the box is saved in the centre of the goal. Assisted by Savannah McCaskill. Offside, Sky Blue. Savannah McCaskill tries a through ball, but Katie Johnson is caught offside. Savannah McCaskill (Sky Blue) hits the left post with a right footed shot from outside the box. Attempt blocked. Madison Tiernan (Sky Blue) right footed shot from outside the box is blocked. Assisted by Katie Johnson. Attempt blocked. Savannah McCaskill (Sky Blue) right footed shot from the centre of the box is blocked. Assisted by Carli Lloyd. Attempt saved. Sydney Leroux (Orlando Pride) header from the centre of the box is saved in the top right corner. Assisted by Carson Pickett with a cross. Goal! Orlando Pride 1, Sky Blue 0. Sydney Leroux (Orlando Pride) left footed shot from the centre of the box to the bottom left corner. Assisted by Chioma Ubogagu with a cross.